Barbara Ann Goodrich, 83, Topeka, died peacefully on Sunday, January 20th, 2019, in her home. She was born in Rock Creek, Jefferson County, Kansas, October 29, 1935 to Cecil and Luella (White) Tosh. Barbara graduated from Atchison County Community High School in 1953 then moved to Topeka to work for Bell Telephone. She began playing fast pitch softball as a pitcher for the Topeka Oshe Meats/Teamsterettes in 1954 until she retired from the game in 1969. She received induction into the Kansas Softball Hall of Fame in 1995. Barbara was a stay-at-home mom for many years then worked for Richman Gordmans for 14 years before she retired in 1987. She was a lifelong Boston Red Sox and KU Basketball fan and enjoyed watching her grandchildren play baseball. Barbara married Duane Goodrich on June 7, 1957 in Topeka. He survives. 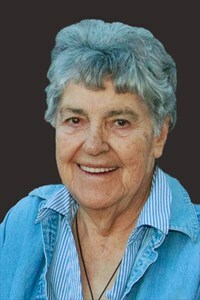 Other survivors include her four children: Bret (Jean) Goodrich, Derie (Steve) Briman, Bretta Hopkins-Birkenfeld (Joe) and Dara (Graydon) Wilson; nine grandchildren: Jordan (Jess) Schuster, Garrett Schuster, Caleb (Kelsey) Hopkins, Cody (Devyn) Hopkins, Colton Hopkins, Luke, Drew and Brant Wilson, Jaye Goodrich; and five great-grandchildren. She is also survived by brothers, Loren and Joe Tosh; and sister, Sue Manthe. Barbara was preceded in death by brothers, Donald, Millard, and Harold Tosh; and sister, Melva Bowie. Celebration of Life services will be at 11 a.m., Saturday, January 26th at Penwell-Gabel Midtown Chapel, 1321 SW 10th Avenue, Topeka. Barbara has chosen cremation and a private burial will be held at a later date at the Valley Falls Cemetery in Valley Falls, Kansas. To leave a special message for the family please click the "Share Memories" button above. Add your memories to the guest book of Barbara Goodrich. I'm so sorry for your loss. For the short time I have known her she was a very kind person and always had a smile in her face. She would be positive even in the not so best of times. She will be truly missed. Barb was the ultimate good person and tough competitor, so enjoyable both on and off the field. She made tough look easy. I was lucky to know her and her family. Barb was such a caring person. We enjoyed getting together once a month for our cousins dinner out until health issues stopped that. We always had a lot of conversation especially about the Jayhawks! Duane your in our thoughts and prayers. My sincere condolence to the family of Barbara. I caught many a pitch from her talented hands when she played for Ohse Meat Company. God bless. So sorry for your loss. I worked with Barb at Richman Gordman. She was always upbeat and fun to work with. My prayers are with you. Duane, So sorry Barb has gone to heaven. Fond memories of years ago, dinner and you and Fred playing golf. My heart and sympathy goes out to you and all your family. I am so sorry to hear of your loss. I have such fond memories of the times I spent at your home. Always so kind. My thoughts and prayers are with you. So sorry to hear about Barb's death. I have such fond memories of playing softball w/ Barb for OHSE’s? We all had such great times. When Duane and Barb lived up stairs at Grandmas house. I had breakfast with them one morning and I remember when we sat down to eat. Duane and Barb leaned over the table and kissed. I was so impressed with them and I still am. I still to this day try to live up to their standards. Daddy took our family to watch Barb pitch at one of her games. She was unbelievable, I still brag about my cousin who could pitch better than any boy I knew. After our Daddy passed, Barb and Duane took Mom under their wings. Mom didn't know much about basketball till Barb introduced her to the KU basketball team, and then she was hooked. I know our Mom and Dad, Marge and Glen, are the first in line to welcome Barbara into heaven. Bill and I Love you and you will be missed. I am positive your angel wings are in heaven waiting for you. I am so sorry for your loss of Barbara. She was a wonderful Lady and her kindness was strong. She was so kind to my parents Harlan and Kitty Bram (neighbors). You guys were great with my parents especially to Dad after Moms passing. She was always kind to my Dad and always looked after him in those last years of his life. She was a great, great Lady! She has a special place in heaven. My family sends you our deepest sympathy and our prayers and thoughts are with you and your Family, always! God Bless you! Our deepest sympathies to the entire family for your loss.